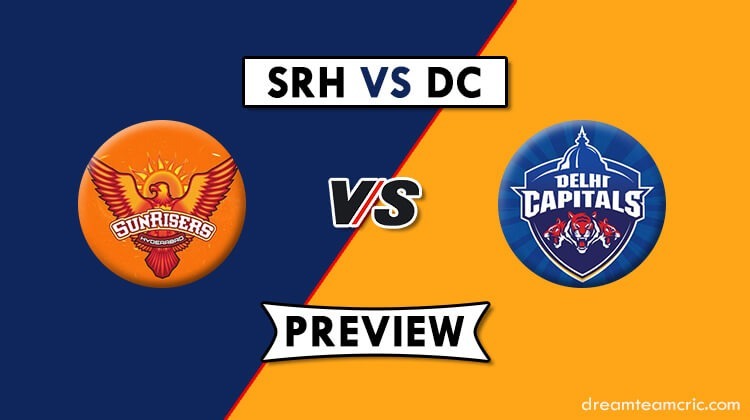 It is time for the second match of the Sunday doubleheader which will be played at the Rajiv Gandhi International stadium in Hyderabad between the home side Sunrisers Hyderabad and the Delhi Capitals. With confidence bursting, the Delhi Capitals will be eyeing their third win on the trot after their impeccable show at the Eden Gardens last night where they pummeled the home side by 7 wickets. Although they lost in the first round against this same opponent at the Feroz Shah Kotla by 5 wickets, but the momentum they carry with them as of now can help them tame the Sunrisers in their own den. The Sunrisers, on the other hand, will be playing after a 6-day layoff and will look to shrug off their last two disappointments against Mumbai and Punjab. Their last two loss came away from home which clearly states that they are a robust unit while playing at home. They will look to come back to winning ways in their fortress and gain some momentum for the upcoming games. The last battle between these two sides took place at the Feroz Shah Kotla where Jonny Bairstow took the game away from the Capitals single-handedly. The Sunrisers chased down a total of 129 runs on a slow deck with 5 wickets to spare. Talking about the overall battles between the two teams, Sunrisers lead 9 games to 4 out of the 13 encounters played between the two sides. Here, we have come up with several Grand League teams which may help you reap a substantial amount playing the grand league. The two matches played this season on this surface has witnessed the batsman making the most out of the surface. The pitch has a good carry for the fast bowlers and some early movement is also seen from the seamers. Sunrisers skipper Kane Williamson has regained his fitness and is likely to replace Mohammad Nabi in the playing 11. Delhi Capitals are not going for any changes in their batting department. Keemo Paul who had a nightmare of a game against KKR might get replaced by Sandeep Lamichhane. Delhi Capitals: Shreyas Iyer (c), Amit Mishra, Kagiso Rabada, Ishant Sharma, Colin Munro, Hanuma Vihari, Ankush Bains, Prithvi Shaw, Sherfane Rutherford, Rahul Tewatia, Jalaj Saxena, Shikhar Dhawan, Rishabh Pant(wk), Colin Ingram, Keemo Paul, Axar Patel, Harshal Patel, Manjot Kalra, Chris Morris, Sandeep Lamichhane, Trent Boult, Avesh Khan, Nathu Singh, Bandaru Ayyappa. Sunrisers Hyderabad: Vijay Shankar, Yusuf Pathan, Kane Williamson, Jonny Bairstow, Siddharth Kaul, David Warner, Manish Pandey, Bhuvneshwar Kumar, Deepak Hooda, Sandeep Sharma, Rashid Khan. Delhi Capitals: Shreyas Iyer, Rishabh Pant, Kagiso Rabada, Sandeep Lamichhane, Shikhar Dhawan, Colin Ingram, Prithvi Shaw, Ishant Sharma, Rahul Tewatia, Chris Morris, Axar Patel. The Sunrisers Hyderabad have played 2 games at their home this season and have won both of them. They have looked robust at home and we are here with a team which will focus on the strength of the home side. The Rajiv Gandhi International Stadium offers good assistance to the stroke makers. Therefore, here is a team which will go for the batsmen who have been scoring regularly for their respective side. The middle order of SRH has been struggling so far as the bulk of the scoring has been done by the openers Jonny Bairstow and David Warner. Here is a team which will feature the middle-order batsmen of SRH.